The swimming pool pump will pump pool water through the swimming pool filter.That filtered pool water will then pump through the swimming pool heater. When turned on, the swimming pool heater will open up the main burners where gas will combust and heat up filtered pool water inside the heat exchanger plumbing. This filtered, heated water will return to the pool and diffuse the heat throughout the pool until the pool water changes to the desired temperature set on the swimming pool heater. The heater will then close the main burner valve and stop the combustion until the pool water temperature drops under the set temperature when the pool heater would combust again. The swimming pool heater has changed quite a bit this past 20 years. 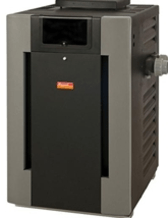 Many areas have high air standard regulations now and Low NOx pool heaters are the answer. Older pool heaters were mechanical with dials and they were pretty basic. They lasted longer, had fewer problems, and were just about as gas efficient as pool heaters today. Modern pool heaters have lower toxic emissions, digital displays, and stay cooler than older designs, so they are much better for pvc piping. The modern Lo NOx swimming pool heater has more parts including electronics, computer boards, fans, etc. Computer boards in an outdoor setting provide for many of the repairs we see in the field. You can expect more expensive repairs, shorter lifespans, and more parts needing replacement over time. Innovation has a cost and there is no way to sugar coat this. That said, we don’t need copper plumbing anymore and our air is cleaner. 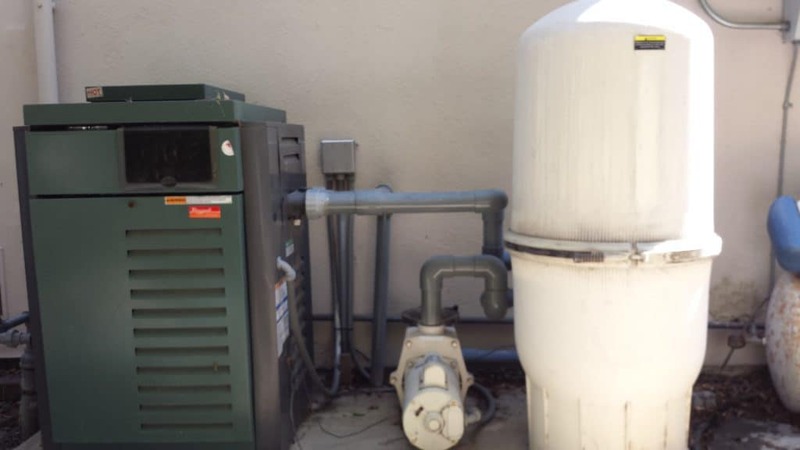 Swimming pool heater repairs involve troubleshooting and can get costly. Computer parts in an outdoor setting, electronics, fans and blowers, and more parts and features than older heater designs demand more repair. 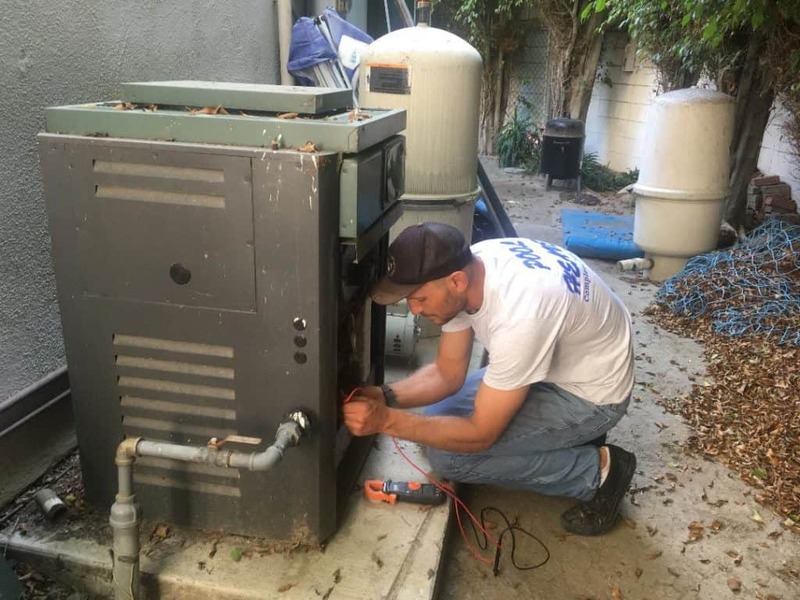 Read more in our pool heater repair section. Automation has made heating pools and spas very convenient. You can turn your heater on from a cell phone, indoor panel, or remote control today. There is no excuse for people to not be enjoying their swimming pools and spas. The modern swimming pool heater synchronizes with pool control automation for an enhanced swimming pool experience. Keep in mind that this automation also calls for more repairs for electronic valves, computer boards, relays, switches, and sensors. 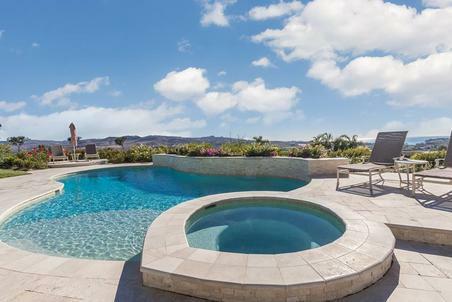 Salt water pools have added a curve ball to the game as well. Salt water can be corrosive to metal, so there have been some issues with copper heat exchangers and the Hayward swimming pool heater comes stock with a cupron nickel plated heater exchanger which is more durable. You can purchase this upgrade with the Raypak heater which is probably our favorite heater to install. There are several things to consider when choosing the right swimming pool heater for your pool or spa. You can read our article about which pool heater is best for you. 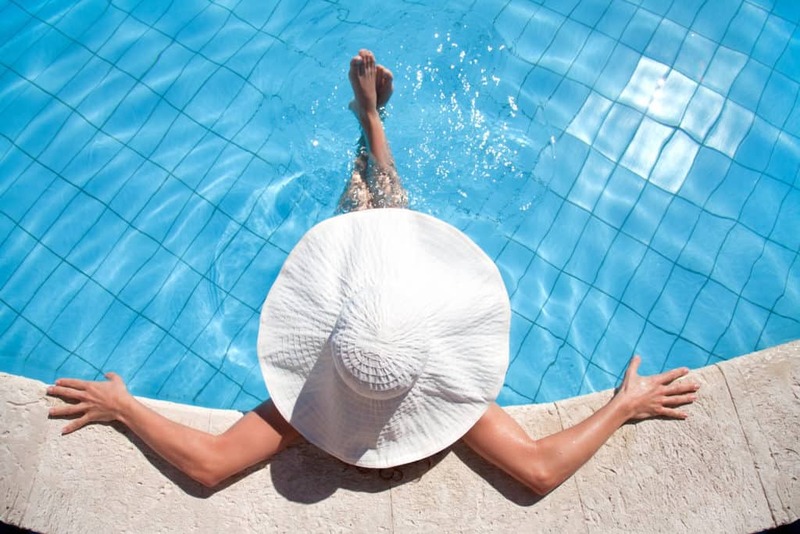 Find out which brand of swimming pool heater is the best fit for your pool or spa. Newport Beach Swimming Pool Heater Installation, Newport Coast Swimming Pool Heater Installation, Cypress Swimming Pool Heater Installation, Huntington Beach Swimming Pool Heater Installation, Westminster Swimming Pool Heater Installation, Costa Mesa Swimming Pool Heater Installation, Fountain Valley Swimming Pool Heater Install Installation, Santa Ana Swimming Pool Heater Installation, Garden Grove Swimming Pool Heater Installation, Orange Swimming Pool Heater Installation, Tustin Swimming Pool Heater Installation, Villa Park Swimming Pool Heater Installation, and Orange Swimming Pool Heater Installation.